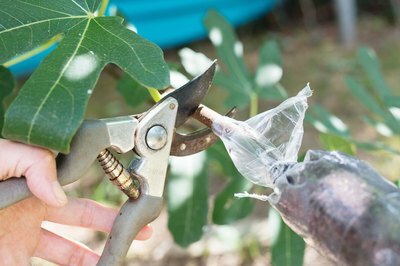 If you’ve tried unsuccessfully to root a cutting from your favorite fruit tree, air layering may be the propagation method that works for you. Some fruit trees are difficult to root from severed cuttings, but air layering allows you to produce a cloned plant while it’s still attached to the parent tree. The developing plant depends on nutrients from its parent tree until it can stand alone on the roots it forms. 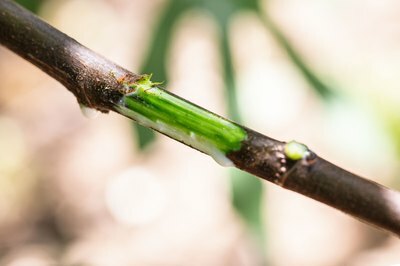 Different propagation methods have varying degrees of success on different fruit trees. Air layering techniques are suitable for tropical fruit trees, such as mango (Mangifera indica, U.S. Department of Agriculture plant hardiness zones 10b through 11), and loquat (Eriobotrya japonica, USDA zones 8 through 10). Although edible fig (Ficus carica, USDA zones 6 through 9), which has invasive tendencies in some areas, bears seedy fruits, the seeds typically produce plants with variable traits. Air layering fig trees is the propagation method that assures second-generation plants are replicas of their parents. You can air layer a fruit tree at any time of year. If you prepare the stems in spring or early summer, however, the new plants may be rooted and ready to transplant in the fall. Select a pencil-sized shoot and measure 12 to 15 inches from the branch tip, which is where you will air layer the stem. Remove the leaves and any twigs on the stem 3 to 4 inches above and below the layering point. Gently scrape off the bark around this point to remove a 1-inch ring. Take a handful of damp sphagnum peat moss that has been soaking in water for several hours. Squeeze the moss until it is damp but water no longer drips from it, and place the moss on a sheet of plastic wrap. As you encircle the moss around the stem where you removed the bark, secure it in place by wrapping the plastic around it. Using a wire twist tie, seal the bottom of the plastic wrap around the stem. Secure the top edges of the wrap with another twist tie so the stem is completely covered by the moist moss and encased in plastic. 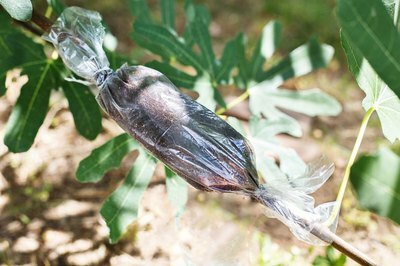 Roots will form inside the plastic pouch, on some trees as soon as one month. When the new root system fills the moss, cut the stem off the fruit tree just below the rootball. 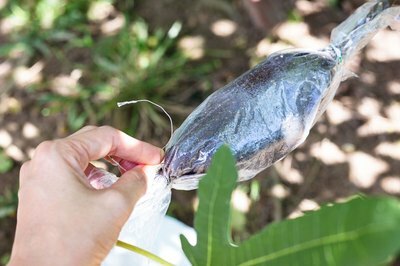 Remove the plastic wrap, but leave the moss intact and plant the new fruit tree in a container or directly in the ground. Sterilize pruning tools so that you do not transmit any diseases to the new plant. Soak tools for at least 5 minutes in a solution of one part bleach and three parts water. Rinse the pruners with water or let them air-dry before making any cuts.